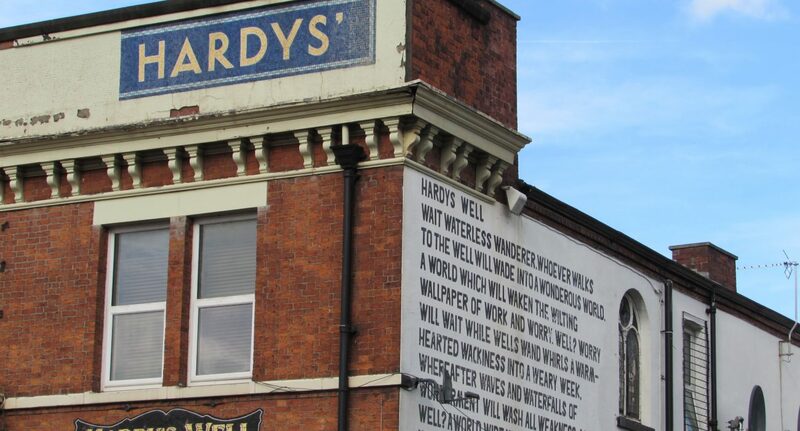 Mancunians have expressed anger over a proposed redevelopment of beloved public house Hardy’s Well. The pub, located at the end of the curry mile, hasn’t been in use for a number of years but is seen by many as an artefact and a ‘central part of Rusholme’s identity’. The new plans – originally submitted to the council a year ago – would see the iconic pub turned into flats and shops, with the pub’s frontage saved and partly kept unchanged. The 200-year-old pub is the site of Lemn Sissay’s legendary poem ‘Hardy’s Well’. The renowned poet and Chancellor of the University of Manchester describes the piece as “public art”. Sissay himself told The Mancunion that he was sad that the poem would be removed, and hoped that it would find a new home. He said: “I’ve been aware for some time that Hardy’s Well was nearing its end. Hardy’s became “the poem with the pub on the side of it” as much as “the pub with the poem on the side of it. “Since the 1960s, living poets weren’t putting poems in public spaces. Now, from Simon Armitage to Helen Mort, poems in public space have become part of the cultural landscape of Britain. Councillors and residents groups have also raised concerns about the proposed plans leading to additional traffic and congestion, with parking said to be a particular issue in the area. However, some have struggled to see the issue with the proposed redevelopment. Harry Hamish Gray, an aerospace engineering graduate shared the proposed redevelopment on Fallowfield Students Group (FSG), calling it a ‘monstrous tumour’. He added: “They may just see it as ruins, but many of these buildings are important to our shared history and culture.